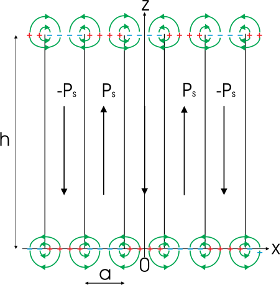 Nonlinear screening of electric depolarization fields, generated by a stripe domain structure in a ferroelectric grain of a polycrystalline material, is studied within a semiconductor model of ferroelectrics. It is shown that the maximum strength of local depolarization fields is rather determined by the electronic band gap than by the spontaneous polarization magnitude. Furthermore, field screening due to electronic band bending and due to presence of intrinsic defects leads to asymmetric space charge regions near the grain boundary, which produce an effective dipole layer at the surface of the grain. This results in the formation of a potential difference between the grain surface and its interior of the order of 1 V, which can be of either sign depending on defect transition levels and concentrations. Exemplary acceptor doping of BaTiO3 is shown to allow tuning of the said surface potential in the region between 0.1 and 1.3 V.